Whether you call it deep cleaning or Spring cleaning, it’s all about getting right to the nitty gritty of dirt and grime. Who needs some deep cleaning tips? Interestingly, the tradition of an annual or semi-annual ‘deep clean’ isn’t a new one. Some place the origins in Iran, where a ritual cleaning, known as ‘shaking the house’, was undertaken to mark the vernal equinox. Others attribute the use of the term to the Jewish practice of cleaning the home prior to Passover, to rid it (historically) of any remnants of leavened food. The English have been using the term ‘Spring Cleaning’ in one form or another since the 1850s. Wherever it comes from, the notion of an annual (or semi-annual) deep clean is steeped in historical context. None of this makes Spring cleaning any easier or more fun to do though, right? So let’s call it a necessary evil that is best survived with some tips on how to get it done right! If you don’t declutter, you’ll end up moving stuff from one spot to another, with none of it ever leaving your home! The key areas for clutter tend to be dining rooms, entranceways and bedrooms, so start there. Decluttering is all a matter of looking hard at all of your stuff and deciding if you really need it or not. Then you have to make sure that everything that has to stay has a home and that home is NOT the floor by the front door, or the chair in the bedroom. Going from top to bottom is a more systematic way of looking at your home. It ensures you don’t miss a part of it that you might otherwise not bother with in a regular weekly clean. Start at the ceiling and work your way down. You’ll be amazed at how much dust and dirt accumulates in those hard to reach and never touched places! Cobwebs that formed in the corners need to be brushed away, and tackle the dust on the ceiling moulding, on the ceiling fans or light fixtures, air vents, the tops of otherwise unreachable cabinets and shelves. Then work your way down and look for marks on the walls, dust on any permanent wall fixtures or hangings, and finally, dust or dirt on the baseboards. Damp microfibre cloths are the best for this job, as dusters do little but move the dust around! You’ll feel a sense of accomplishment if you get some of the big ticket cleaning items out of the way first. Once they’re done, little jobs like cleaning out the front hall closet and adding in some baskets for all the odds and ends that seem to accumulate will seem like easy work. Flipping and turning and refreshing your mattresses. Emptying the fridge and freezer and cleaning them thoroughly. Steam cleaning the carpets or refinishing the hardwood where it has gotten scuffed or damaged. This one requires moving the furniture around to make sure you’ve tackled every otherwise hidden spot! Mix all your ingredients in a bowl; just go easy when adding the vinegar because (and if you have kids who like ‘at home science experiments’, you’ll know this already) baking soda and vinegar tend to bubble and foam. Spread the mixture in your oven floor, sides and the glass door (best to remove the elements from inside first). Scrub any stains and, with a clean cloth, remove any remaining cleanser. Voila! Sparkling clean and it smells good too. Spray wash the siding / re-stain the wood trim / refinish the porch or decking. Remove all the winter detritus like fallen leaves and branches, rake up old dead grass and check for rogue piles of dog poop that appear when the snow leaves. Don’t forget to get everyone involved: your kids will value their tablet time all the more when they’ve finished fishing old socks and who knows what else from under their beds! Above all, remember to keep your expectations realistic. You probably can’t get it all done in a day, so don’t try. Ease into it and reward yourself at the end of the day with a glass of wine or a hot bath. 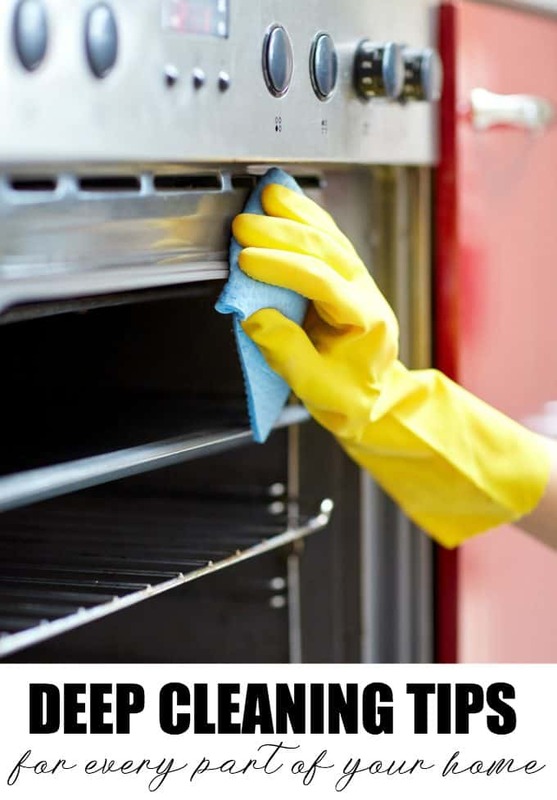 You might also like these oven cleaning hacks or wall washing hacks. I also have a post on how to remove candle wax from a carpet. Do you have any deep cleaning tips to share? I’m always looking for great ideas on maximum clean up with a minimum of pain! the de-cluttering is so important!! I truly can use any tip I get! I can’t thank you enough for this awesome handy list! Great tips! I started in January and have the Kitchen, the two bathroom and half the living room done. I do it when I can. I’m usually done by now. I need to remember to turn my mattress next time I change the sheets. My tip is to do it with music. Makes cleaning go better. Great tips. I always like tackling the larger jobs first because they take the longest and it is always nice to see them completed. These are great tips .I love cleaning but Ihate sorting through clutter so I try to stay on top of that one. Great tips. I like the recipe for the oven cleaner. After many, many years I now have a self-cleaning function on my oven which is definitely a huge plus. In fact I’ll have to use it soon as I’ve noticed my son made quite a mess of it when he used it. Thanks for the oven cleaner ingredients, tried it out on the weekend and it worked great. Will never buy commercial cleaner again.